Genea-Musings reader Jim asked this question several days ago in email, so I thought my readers might want to hear my answer. I mentioned "one-name studies" in my post Exploring the New FamilySearch Collection "Pennsylvania Civil Marriages, 1677-1950" last week. "Family historians generally focus their efforts on researching their own family trees, collecting and analysing data in order to find as much detail as possible on every branch, twig or tiny leaf. Others compile surname studies, which seek all occurrences, past and present, of a single surname, anywhere in the world. A one-name (or surname) study is a project researching all occurrences of a surname, as opposed to a particular pedigree (ancestors of one person) or descendancy (descendants of one person or couple). Some ‘one-namers’ restrict their research geographically, perhaps to one country, but true one-namers collect all occurrences worldwide." 1) Why am I doing a One-Name Study for some of my family surnames? a) Most genealogists and family historians are interested in their family surnames, and I'm no exception. My great-grandparents were Seaver, Hildreth, Richmond, White, Carringer, Smith, Auble and Kemp. b) I had very few first cousins - 8 on my father's side, none on my mother's side. One thought was to try to find other descendants of my greats, great-greats, etc. in hopes that they might have more information about the common ancestors, and perhaps they would have more information about my families as well (after all, who did my grandparents send letters and family pictures to? Their distant relatives!). c) It wasn't the case at the beginning of my research, but DNA connections are excellent leads to distant cousins - persons who share a common ancestor. Y-chromosome DNA connections are always on a paternal (usually a surname) line. Autosomal DNA connections can occur on any line, so it makes sense to work on a number of my surnames. d) I had some ancestors for whom I did not know parents - Vaux, Newton, Dill and Buck are examples. So I started researching persons with those surnames in the places near where my end-of-known-line ancestors lived. e) Libraries were full of surname descendancy and local history books in the 1990s, but there were none for my Seaver, Carringer and Auble surnames, and my lines were not in the books for the other surnames listed above. 2) What was my process over the years? a) Well, when I started in the late 1980s and early 1990s, it was to find every occurrence of the names in published books, published periodicals, magazine queries, and online forums (e.g., Prodigy, AOL), especially if they occurred in my places of interest. The thought was that persons in those places were probably related to my known ancestors without parents. In this early time, I had notebooks and stacks of papers. I tried making pedigree charts and group sheets, but it was tedious. 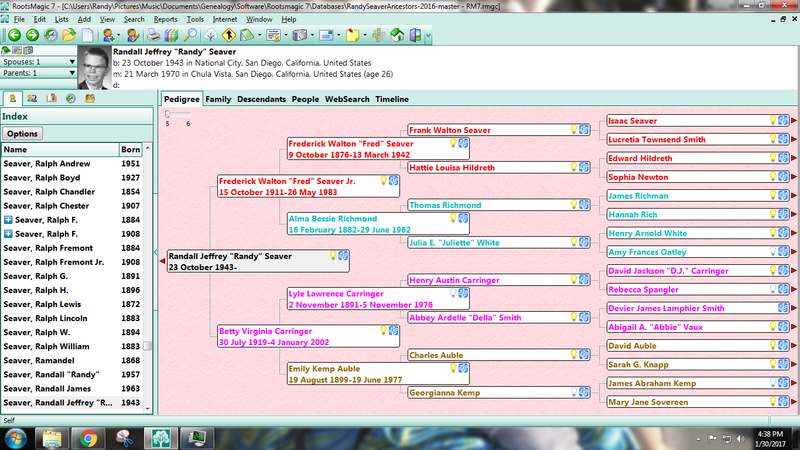 b) I started a family tree in Personal Ancestral File, and graduated to Family Tree Maker in about 1998, and kept adding information from the paper files. Of course, I kept adding copies from books, periodicals, microfilms, the IGI, and Ancestral File and collected a lot of names. Then there were the WorldConnect family trees, online message boards on Rootsweb and Genforum, and email mailing lists that added data. I hoovered up a lot of Seaver and Carringer and Auble information from vital, census, and other records! c) When online records came along, I started monitoring websites like Rootsweb, Ancestry, Genealogy, and others and kept collecting names and records. I eventually switched to RootsMagic as my software, and then there were online family trees to fill up. In 2008, I decided that I'd better start documenting my tree and started adding sources citations to my tree persons and events. d) Now, there are hundreds of online record collections on sites like Ancestry, MyHeritage, Findmypast, Fold3, GenealogyBank, AmericanAncestors, and more. I try to "mine" these collections for my surnames and add names, relationships, events, dates, places, sources and notes to my RootsMagic database. I do this almost every day. In the process, I manage to connect unconnected persons to a bigger tree, or a "bush" (a small tree) to the bigger surname tree. 3) As an example, I now have 5207 entries for the SEAVER surname, and 452 for the SEVER surname, 78 for SEAVERS, etc. I have over 100 "shrubs" or "bushes" that I haven't connected to the big "my" tree with over 47,000 persons. Granted, almost all of my surname study persons are in the USA and Canada because that is my area of interest. 4) I have my family tree information in online trees, or portions of trees, on Ancestry, MyHeritage, Findmypast, WkiTree, Geni, WeRelate and FamilySearch Family Tree. I try to update the trees occasionally, but I use them mainly for Hint generation, blog fodder, and cousin bait. 5) Every so often, I create online e-books for some of my Surname Studies on Scribd (https://www.scribd.com/user/43095920/Randy-Seaver). Links to my online family trees and Scribd books at http://www.geneamusings.com/p/randys-genealogy.html. Looking at these, I realize I need to update the books. Why on Scribd? Because the content is searchable and I can publish large e-books for free. Cousin bait! 6) Some will say I haven't been doing a true registered one-name study with a website and a forum and the other features, and they are correct. I'm doing this for me, and my cousins, and I've chosen to do it my way. This blog takes more than enough time to feed! I have toyed with having blogs for each surname of interest, but haven't done that because I can still post about all of my ancestral families on this blog, and it is searchable, and has a relatively large readership. 7) So that's my story, Jim. Good luck with your research if you choose to do a Surname or One-Name Study. Thanks what a great post. I have a couple names that I look for everywhere also - I guess it's my own "one-name study"
I looked at one of your scribd publications - they looked great and I hadn't heard of scribd. I have it on my list of things to check out. I never thought about posting a short "book" as cousin bait. I've just posted some of my lines on the usual suspect list like you have. Randy, great ideas. I am also a Seaver, well my mother is. I have seen you list them sometimes but I know they are not your line unless I have missed something. My line comes from the Norwegians of Iowa and North Dakota. Seaver was a first name which became the family name. There is even a Seaver K. Seaver. I would be interested in seeing who you have in this part of your research if at all possible. Please email me at randy.seaver@gmail.com and i'll send you a PDF report on what I have for descendants of Knudt and Thora (Hyland) Seaver. I've always been sort of collecting information of the Zalewski surname, partly out of curiosity and hopefully to determine the birth location of my great-great-grandfather. Funny story, just last week I started officially documenting all of the Zalewski lines in the Milwaukee, Wisconsin area (8 major lines so far) to see if/how they're connected. It's been fun so far. Did a blog post on it yesterday.